A blue-white stillness, frozen many times over. The soft sweeping and pattering of branches bowing against the ice, as a giant bison scratches against the trunk of a conifer tree. Somewhere, far off, the ice can be heard cracking; struggling to retain its dominance against the disruption of moving, warm water below. The wind picks up for a moment, carrying a piercing stream of tiny crystals; painful diamonds glinting in a bright blue sky. And then, from a space buried under 2500 feet of obvious winter, the earth suddenly spasms as an opening is ripped through a giant glacial barricade three miles long and ten miles across. Thunder pounds across the freezing desert as an ocean of churning water swallows the world. This is the Pacific Northwest at the end of the last Ice Age, approximately 12,000 – 15,000 years ago. As the Cordilleran ice sheet made its way out of Canada, it dammed the Clark Fork River at the Idaho/Montana border. The resulting reservoir—500 cubic miles of water at its peak, and as big as Lakes Erie and Ontario combined—was Glacial Lake Missoula. Research suggests there were at least 40 of these floods over a span of about 2,000 years. It took about two days for the powerful flood waters—sometimes up to 1,000 feet deep—to tear across Idaho, Oregon and Washington. As it roared toward the Pacific Ocean, the 85-mile-per-hour torrents chewed through everything in their path and carved the earth in ways that are evident to this day. As glaciers grind against each other, the rocks they’re ferrying inside become pulverized. During warmer periods, the “rock flour” inside the Cordilleran ice sheet flowed as runoff into Glacial Lake Missoula, enriching the water with a cloud of mineral nutrients. Algae bloomed in abundance, thriving off the fertile “soup,” and attracted organisms who fed off the basic foodchain. Over time, the rock flour sifted to the bottom as silt, the organisms that lived off the organic matter during warmer weather froze, the weather warmed once again, and the cycle repeated again and again and again. When the giant ice dam broke, this rich bath of organic matter washed across the entire flood plain, painting it with thick deposits of nutritious silt. Today, long after the glaciers have melted from the area, the Columbia Valley and surrounds are some of the most fertile agricultural regions in the country. Chateau Ste. Michelle recently invited journalists to experience some of the best examples of how that rich soil translates into wine. Col Solare, Northstar and Spring Valley Vineyard are all part of the Chateau Ste. Michelle family, but they are each independently run. 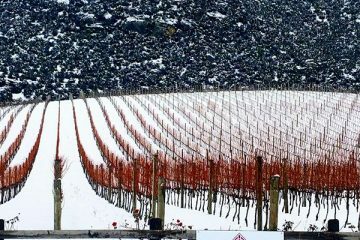 What they have in common is a commitment to world-class winemaking and true expression of the unique terroir of Eastern Washington – a terroir that wouldn’t exist today without the cataclysmic Great Floods of ions ago. Col Solare winery is built on 30 acres in Washington state’s Red Mountain AVA (within the larger Yakima Valley and Columbia Valley AVAs). It is a relatively new winery, the product of the conversion of two of the wine industry’s modern-day monoliths: Tuscany’s Marchesi Antinori and Washington’s Chateau Ste. Michelle. Its origins stretch back to 1992, when Marchesi Antinori visited the Columbia Valley and embarked upon a partnership with the region’s oldest and largest winery there. Just as the Antinori family had done with their revolutionary “Super Tuscans,” Marchesi wanted to make Cabernet Sauvignon-based wines, aged in French oak, that would appeal to an increasingly international palate – but do this in Washington. Antinori and Chateau Ste. Michelle entered into a 50/50 partnership, and produced their first vintage together in 1995. 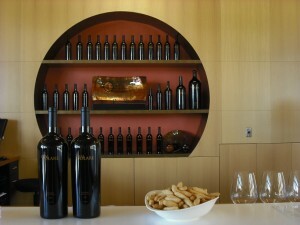 The winery, planted with blocks of Merlot, Petit Verdot, Malbec, Cabernet Franc and Syrah, in addition to the 18 acres of Cabernet Sauvignon, is spread out like rays of the sun—a fitting design for Col Solare, which means shining hill, in Red Mountain AVA, named for the color the grass turns during summer’s hottest months. Like most of Washington’s vineyards, Col Solare sits on a foundation of Quaternary glacial flood sediment and basalt beds. On top of this is a thick loess typical to the Columbia Plateau, deposited mostly during the Pleistocene Era, and some from the Holocene Era. This loess was formed by wildblown slackwater sediment, and occurs in high volume on Red Mountain, due to the proximity of the Pasco Basin – the “holding tank” for giant oceans of Missoula floodwater. While soil composition does vary considerably across the AVA, most of the area is also covered by a high concentration of gravel, washed in from the floodwaters. The sandy loess and gravel do not hold moisture well, forcing the vines to struggle for water. This, combined with low yearly rainfall and higher average temperatures than surrounding AVAs, tends to produce powerful, intense fruit. 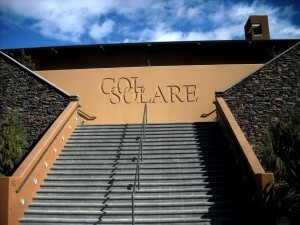 Col Solare was opened in 2007, and still sources many of its grapes (40% from Red Mountain, the rest from the greater Columbia Valley), although their fruit is increasingly estate-grown. Within the next few years, the winery is looking to become 100% Red Mountain, with hopes to source exclusively from what they grow on-site, in the near future. Taking a page from Antinori’s Old World playbook, the goal at Col Solare is ageability, and they suggest cellaring for five to six years for the wines to be at their peak. With the luscious, ripe Red Mountain fruit and the house style’s rich mouthfeel, it’s unlikely any of the Col Solare wines wouldn’t be tasty just to pop and pour, but the 2004s and 2005s certainly possess a smoother, more restrained quality than the bigger, hotter 2009 pre-releases. The 2007 Col Solare is the winery’s current release and winemaker Marcus Notaro says it’s one of the best vintages Washington has seen in fifteen years. That year’s heat spike, followed by cooler weather, produced more austere, complex wines. Certainly the ‘07, with its seductive black berries and silky mocha espresso, demands attention. Notaro says the 2009s are the best Cabernet Sauvignons they’ve seen; but with 2007 on shelves right now, it seems the ‘09 release is eons away. 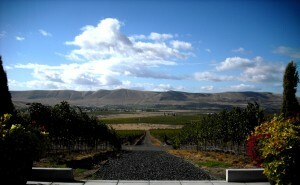 Washington’s Columbia Valley began to establish a reputation for producing world-class Merlot back in the late 1980s and early 1990s. It’s from these AVAs that Northstar makes their Merlot, sourcing fruit from vineyards such as Cold Creek, Four Feathers, Horse Heaven, Indian Wells, Red Mountain, Spring Valley and their own estate. 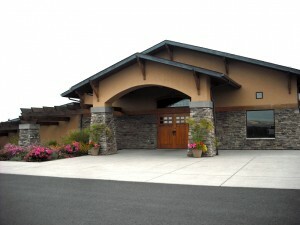 The winery, itself, has been around since 1994. Winemaker David “Merf” Merfeld joined Northstar in 2001. He’d come out to Washington to brew craft beer, but was lured away by the dynamic nature of wine. “It’s the reason I got into making fermented beverages. This is alive,” he says. He became the winery’s winemaker in 2005. Merf says his goal is to create Old World wines with New World fruit, influenced by Bordeaux’s Right Bank. Many of the wines incorporate other Bordeaux varietals, like Cabernet Franc, Cabernet Sauvignon and Petit Verdot. Northstar’s value bottling, Stella Maris, includes 100% varietals of Semillion, Malbec and Syrah. There is a good reason Merfeld compares his wines to those from the world-famous region in France: Walla Walla is on the same latitude as Bordeaux, although Washington has a longer growing season. Merf can compare his region to Red Mountain, too—at least in terms of soil composition. It’s roughly the same as Red Mountain, but at a lower, cooler elevation. The Cascade Mountains trapping chilly nighttime temperatures in the area in the same way they shield against Western Washington’s famous rain. Like Col Solare’s standout 2007 bottling, Northstar’s 2007 Columbia Valley also has an impressive showing. It’s a blend of 75% Merlot, 20% Cabernet Sauvignon and 5% Petit Verdot, aged for 18 months in French oak barrels. The wine is packed with plum, espresso, vanilla and coconut, with a rich, full mouthfeel, backed by grippy tannin. The 2006 Northstar Columbia Valley is a different wine altogether. A blend of 76% Merlot, 19% Cabernet Sauvignon, 3% Petit Verdot and 2% Cabernet Franc, there is a strong presence of eucalyptus and green pepper on the nose, with a warm balance of vanilla and cherry. The eucalyptus and cherry show up again on the palate, joined by heady notes of forest floor, pepper and baking spice. 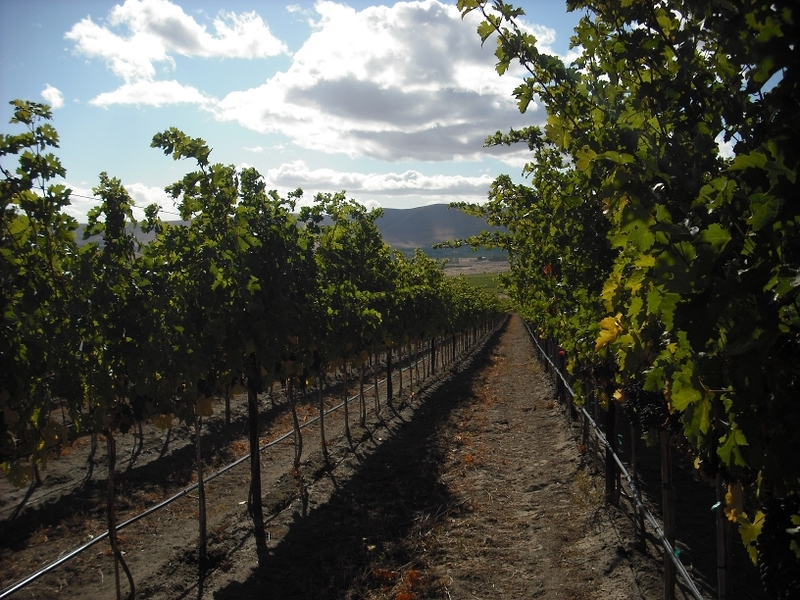 The single-vineyard 2010s each show in their own way – from the Wahluke Slope AVA Stone Tree Vineyard and Beverly Vineyard, to Red Mountain’s Klipsun Vineyard, and Walla Walla AVA’s Anna Marie Vineyard. Of these, the Beverly Vineyard, with its black and red fruit, rose and cherry vanilla; and the Anna Marie Vineyard, with mushroom, pepper, vanilla and black cherry, left a particularly strong and lasting impression. 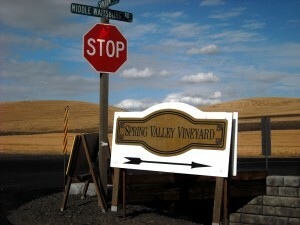 Spring Valley Vineyard is located 12 miles northeast of Walla Walla, and lies nestled among wheat fields in the shadow of the Blue Mountains. It was started as a ranch in 1897, by Uriah Corkrum. In 1993, the family pulled up 45 acres of wheat from their 1000 acres of land, and replanted it with grape vines. Spring Valley Vineyards might be located in a valley, but that valley is in an upland. 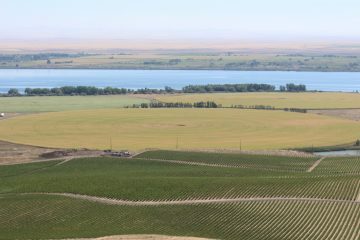 The upland is covered in silty loess, (like much of the rest of the region), but unlike Red Mountain and the area surrounding Northstar, the Spring Valley Vineyard site also contains a great deal of Athena, Palouse and Calouse soils. These soil types are typically more nutrient-rich than the silt and loess in the other two areas, and it’s the standard soil type for Eastern Washington’s native bunchgrasses. Over time, great expanses of bunchgrass were replaced by cultivated wheat. Grapevines are a relatively new experiment. Judging from the thriving vines in Spring Valley Vineyards, the experiment is proving successful. Today, there are 110 acres of grapevines, including Merlot, Cabernet Sauvignon, Syrah, Cabernet Franc, Petit Verdot, and Malbec. The vineyard continues to be run by the family – Uriah’s descendants – passed down from his son Frederick, who was the farm’s muleskinner (someone who drives mules); to Frederick’s saucy, Vaudeville-dancer wife, Nina Lee; their son Dean Derby and his wife, Shari; and Dean and Shari’s daughter, Katherine “Kate” Derby Elvin. Kate’s brother, Devin, did most of the family’s winemaking for years, until his untimely death in a car accident in 2004 – an event that rattled the rest of Walla Walla almost as much as it did the family. In that year, Serge Laville took over winemaking. Laville continues to follow in Devin Derby’s philosophy of minimally invasive winemaking, including some use of spontaneous fermentation, using only estate-grown fruit, and “listening to the vineyard.” Apparently the grapes are whispering great knowledge: Spring Valley Vineyard wines have been on Wine Spectator’s “Top 100” list at least four times since 2002, beginning with their second vintage, 2000. It isn’t just the wines that are noteworthy, it’s their packaging. 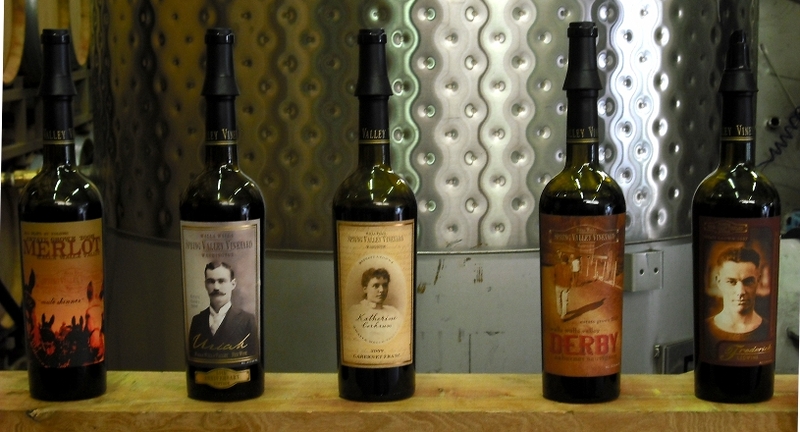 Each cuvee is named for someone in the family, with an accompanying photograph as label. Uriah, a big Bordeaux blend, displays the image of an imposing moustached gentleman, in black-and-white. Katherine Corkrum’s tribute, like Uriah’s, is called just the one name. It’s 100% Cabernet Franc; the 2009, with its ripe strawberry, licorice and clove is not nearly as serious as the photograph on the bottle. The Nina Lee – 100% Syrah – bears the likeness of its spicy namesake, hands clasped behind her curled and bobbed head. There are two wines dedicated to Frederick: the Muleskinner (100% Merlot), shows a sunset snapshot of a hitched mule team; and the Frederick (Bordeaux blend), bears his sepia-toned photograph. Dean’s tribute, called Derby, is 100% Cabernet Sauvignon. The 2008 is all spicy red fruit, with hints of hay and strong, round tannin. The family says all of the 2008s can easily age for twenty years. It’s unclear how much more of the family’s remaining 900 acres of wheat will be turned over to vine, or which of the present-day Derbys will wind up on a bottle. The family is mum on the subject. Only history will tell. 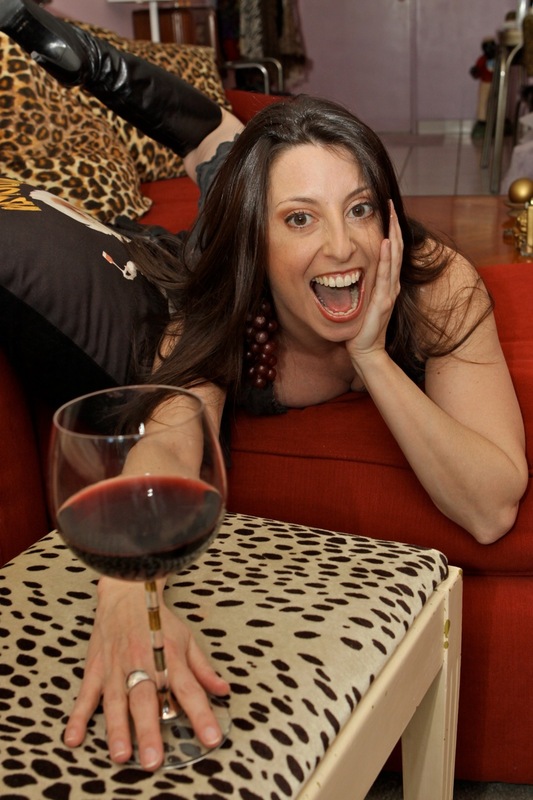 Arianna snacks, sups, sips and swallows – and lives to write about it. Always hungry for food adventures, she stays thirsty for wine and the occasional quality cocktail, as well. When she isn’t buried in her laptop or chasing after a food truck, she’s taking her son on adventures across Los Angeles and opening his mind to the amazing beauty of the world, its people, and the universality of coming together over a good meal. You can read more about her delicious escapades at GrapeSmart.net, MutineerMagazine.com, FoodTruckTimes.com and other assorted fine websites. It is Shari Corkrum(Dean Derby’s wife) who was born in Spring Valley to Frederick and Nina Lee. Dean Derby married into the Corkrum family in 1954.